Hellboy is back, and he’s on fire. From the pages of Mike Mignola’s seminal work, this action packed story sees the legendary half-demon superhero (David Harbour, TV’s ‘Stranger Things’) called to the English countryside to battle a trio of rampaging giants. There he discovers The Blood Queen, Nimue (Milla Jovovich, ‘Resident Evil’ series), a resurrected ancient sorceress thirsting to avenge a past betrayal. 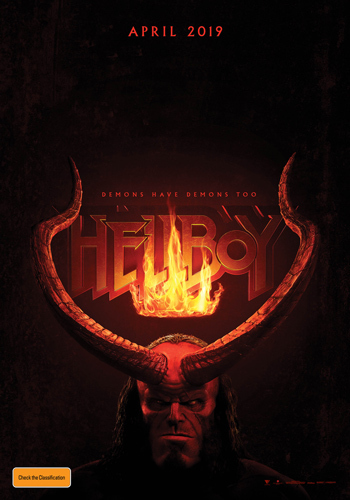 Suddenly caught in a clash between the supernatural and the human, Hellboy is now hell-bent on stopping Nimue without triggering the end of the world. ‘Hellboy’ also features Ian McShane (‘John Wick’), Daniel Dae Kim (TV’s ‘Hawaii Five-0’ and ‘Lost’), and Sasha Lane (‘American Honey’). The 'Hellboy' competition has now closed. Winners will be announced shortly. Competition opens at 5pm AEDT on Monday 1st April 2019 and closes at 11:59pm AEST on Sunday 7th April 2019. Five winners will be chosen at random on Monday 8th April 2019. To successfully win, entrants must fulfil the above entry conditions before the time the competition closes. Current members/followers are eligible to enter the competition. Only one entry per person. Only one winner per household. To be a valid winner, the entrant must not have won a prize from SWITCH within the last 28 days. Each winner will receive one double pass to 'Hellboy'. By entering, you agree to receive occasional emails from SWITCH in the future. If you decide to unsubscribe from these updates, any further entries will not be applicable. Only Australian residents are eligible to enter. 'Hellboy' is in cinemas from Thursday the 11th April 2019 through Roadshow.